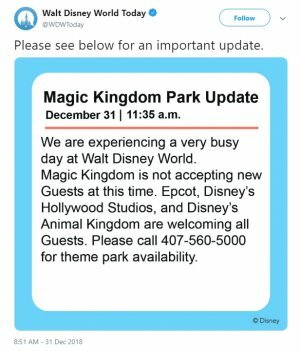 As expected, the Magic Kingdom was closed to new guests starting at 11:35 AM on New Year’s Eve 2018/2019. The park was reopened to guests at 5:15 PM. This meant that new guests could attend the New Year’s Eve celebration at the Magic Kingdom after 5:15 PM. The other theme parks in Walt Disney World remained open to all guests during the day. 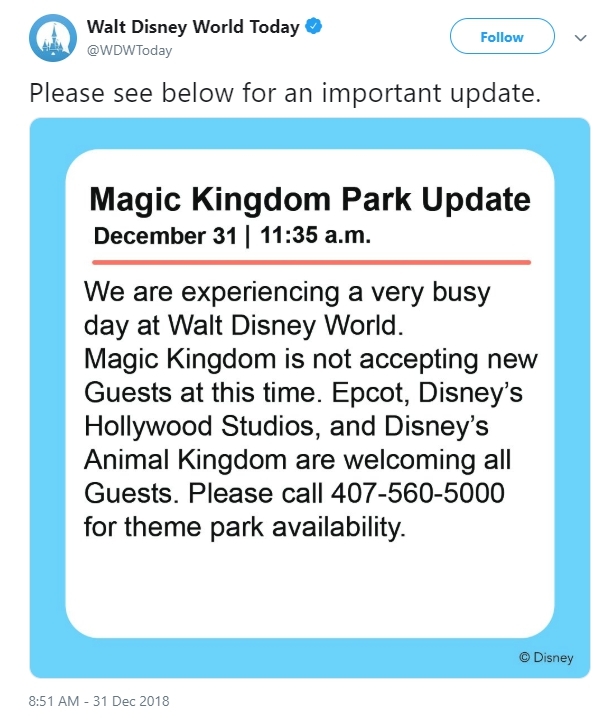 You can view that status reports from Walt Disney World Today on Twitter for the closure here and here for the reopening of the park. New Year’s Eve is one of the most popular days for Walt Disney World and the Magic Kingdom throughout the year. Every New Year’s Eve, the Magic Kingdom usually closes due to the park reaching capacity. Due to the continuous closure of the park over the years, New Year’s Eve may be the busiest day of the year for the Magic Kingdom. Christmas Day was another popular day for the Magic Kingdom, as the park was closed for a brief period of time on Christmas Day 2017. When preparing to attend the New Year’s Eve celebration at Walt Disney World, it is best to prepare to enter the park early if you want to stay at the park for the entire day. In 2017, the theme park was closed for about the same amount of time on New Year’s Eve. Based on the closures for Christmas Day and New Year’s Eve, it seems that traffic may be down slightly from last season. The difference between this year and last year is that the park did not close down for Christmas Day. The park did close for about the same amount of time as last year on New Year’s Eve.